This professor-turned-archivist is determined to make strong Jewish women a thing of the past, present and future. Twelve years ago, Gail Twersky Reimer was on a panel at a Jewish Funder’s Network meeting. The evening’s moderator: donor-activist Barbara Dobkin. a It’s a safe bet that had the two never shared a dais, and had Reimer not subsequently related her vision of gathering and preserving the oft-forgotten stories of Jewish women, there would not be a Jewish Women’s Archive. No Making Our Wilderness Bloom high-school curriculum. No “Katrina’s Jewish Voices” Web exhibit. No Jewesses With Attitude blog. Each of these—and dozens of other JWA projects—would have forever remained only pieces of Reimer’s tantalizing dream of telling Jewish women’s lives. But with these two determined souls behind it and amid the usual organizational birth pains, Jewish Women’s Archive, dedicated to unearthing, documenting and transmitting the legacy of Jewish women, was born. These days, reimer, 57, sits at the helm of a $1.9-million annual budget and a 13-person staff. Headquartered in Brookline, Massachusetts, the national nonprofit membership organization is known for its innovative technology and creative programming. Reimer says she is especially proud that JWA is “making Jewish women a legitimate area of inquiry for students and researchers,” and that JWA is referenced on hundreds of history and university Web sites. “Now students thinking about topics can see that, in addition to African American women and Latino women, Jewish women are subjects worthy of investigation,” she adds. For her efforts, Reimer, a soft-spoken woman with gently graying hair and smiling face framed by wire-rimmed glasses, was named to the Forward 50—a yardstick of influence determined by the Forward newspaper each year. Now entering its teen years, JWA is getting sassy, judging by Making Trouble, a documentary produced by Reimer that celebrates the chutzpa of a half-dozen pioneering Jewish women entertainers—Molly Picon, Sophie Tucker, Fanny Brice, Joan Rivers, Gilda Radner and Wendy Wasserstein. Their legacy is seen through the eyes of young comics Judy Gold, Jackie Hoffman, Jessica Kirson and Cory Kahaney. But Reimer, a longtime vegetarian whose religious practice tends to Torah study and Brookline’s postdenominational Minyan Shaleym, will tell you that she never set out to be a movie producer. Born in 1950 to Holocaust survivors who came to America just after the war, Reimer graduated from Sarah Lawrence College in Bronxville, New York, going on to earn a Ph.D. in English and American literature from Rutgers University in New Jersey. She taught English literature at Wellesley College for nine years before moving to the Massachusetts Foundation for the Humanities in 1987. Her husband, Joseph Reimer, director of Brandeis University’s Institute for Informal Jewish Education, and their two daughters, Tamara (now 28 and a yoga teacher in California) and Ziva (23 and studying at the Pardes Institute in Jerusalem), rounded out a busy and productive life. But Reimer was destined for more. Since she was a youngster, she had been inspired—and in some ways haunted—by the story of her mother, Natalia Geizhals, “a strong, determined, courageous woman who held our family together,” Reimer recalls. Born in Krakow, Natalia sent her son into hiding for the duration of the war and refused an opportunity to work in a factory on Oskar Schindler’s now-famous list, opting to go with her family to Auschwitz. There, as a kapo—Jewish guard—she was able to save many of the women in her charge. Unlike so many survivors who shrank from sharing their experiences with their children, many of Reimer’s earliest memories are of her mother and her six surviving aunts and uncles telling of their time in the camps. From her father, David Twersky, Reimer inherited another powerful legacy, the Hasidic Twersky dynasty. Her grandfather, Rabbi Yehuda Leib Twersky of Kielce, Poland, was imprisoned by the Nazis and, after falling ill in prison, was released to die of “natural causes.” His is said to have been the last of the large public Jewish funerals in Krakow. After her mother died in 1988, as a memorial, Reimer began learning from Jewish texts every day. Much of the studying was in the company of her friend and Brookline neighbor, Judith Kates, with whom she shared a literary background and a passion for 19th-century women novelists. Their studies and mutual longing for a woman’s interpretation of sacred texts led to the publication of their essay collection Reading Ruth: Contemporary Women Reclaim a Sacred Story (Ballantine). There followed a second anthology, Beginning Anew: A Woman’s Companion to the High Holy Days (Touchstone). 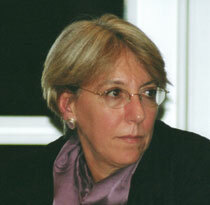 In 1995, at the time of her encounter with Dobkin, Reimer was still with the Massachusetts Foundation for the Humanities, still working on books with Kates. Yet Reimer, no stranger to the world of academia, had no appetite for “gathering materials and locking them in a vault.” Instead, she dreamed of an archive that would be a breathing, dynamic treasure chest of Jewish women’s experience. And, if Reimer was JWA’s mother, Dobkin was its midwife. Founding chair of Ma’ayan, the Jewish Women’s Project of the Manhattan JCC, an outspoken leader of the women’s funds movement and founding chair of the Hadassah Foundation, Dobkin was the perfect match to ignite Reimer’s dream. Together, they engaged a range of women—academics, those with financial means and others with development or marketing backgrounds. Her vision has resulted in a virtual archive where materials are just a click away. JWA’s Web site (www.jwa.org) gets more than 10,000 hits a month from 85 countries, opening windows into history and biographies through film clips, multimedia exhibits, oral histories, school curricula and even recipes written by a Jewish woman in 1898. New from JWA: the CD-ROM Jewish Women: A Comprehensive Historical Encyclopedia, which will eventually be downloadable off the site. Edited by Paula E. Hyman and Dalia Ofer, the compendium was sponsored by JWA and published by the Jewish Publication Society. Authors, scholars, journalists, filmmakers and curators often tell Reimer they look no further than www.jwa.org and its countless links and articles to find answers to their questions about Jewish women—be it in business, politics, religion, sports, activism, the arts, academia or women’s personal and family lives. But as much as she has accomplished, Reimer is realistic about the challenges she faces. Not only is time running out for recording stories from the lips of those who survived the Holocaust, the Depression and World War II, Reimer also remains under pressure to raise more funds to sustain JWA’s trademark programs and grow into even bigger shoes.